Todays art term is LINE. Line is one of the Elements of Art. A line is the path of a moving point, or to quote Paul Klee, “A line is a dot that went for a walk.” Line has a measurement or length and width. There are types of lines: straight or curved, long or short, thick or thin, angular or wavy. Different types of lines are thought to represent different types of feeling or emotion in an artwork. A curvy line is graceful; a horizontal line represents stability while a vertical line is poised. The direction that a line takes helps to move our eyes around an artwork. 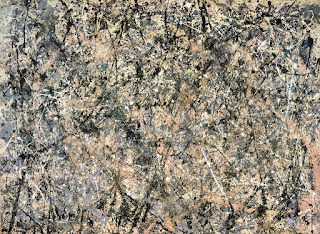 Pollock dripped, threw and streaked paint across his large canvas that was affixed to the floor. The lines created by the paint help to move our eyes around the painting. Does this painting make you feel calm or excited? Tired or energized? Without LINE, there would be no Pollock.